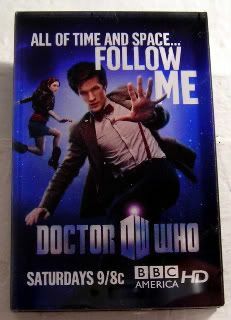 OMG, an official DW magnet! Look, I'm not saying it's because someone in the official Doctor Who world got tired of me using my two official DW magnet sets to magnetblog, or me making my own DW magnets to magnetblog about. Maybe someone at BBC-A just really loves magnets. But dudes. I'm just sayin'. OMG, an official magnet! Eh, it's fine. I can live with my not true-fan status. I'm still more mad about the Paley member communications thing anyway. Besides, in the end, we walked down the street for some supergood S'Mac (Imagine, a place that only sells mac & cheese. Like Rice to Riches that only sells rice pudding, it's one of the happiest places on earth.) and got to watch a police chase at the same time! And ya'll wonder why I don't go below 14th street. I will confess, though, that because of that missed first session at the Paley and this missed session in the village (and no, I didn't want to brave the Apple crazies on Tuesday), I've kinda been avoiding the Whovian media blitz. I don't want to see pictures about what I'm missing. I don't want to see Tweets about what I'm missing. I'm like that spoiled brat who didn't get her candy, and now doesn't want to know that candy exists. Like I know it's out there. But not for me. Yes, I'm pouting. Yes, I'm considering canceling my Paley membership. Still. Hmph. I guess we'll have to see if BBC sends the team out for Comic-Con in July. Oh! I have to tell ya'll, I've been reading the RTD book, A Writer's Tale. Great fun. Heavy to lug around the subways/buses, but worth the read, if you're a fan. Then again, if you're a true-fan, you've probably already read the original and the revised editions. Dude, if they come to Comic-Con, we will get there early and wait. Even if we have to sit through other panels. Bring a book.